TRIBE is our first mannequin collection aesthetically and technically performing dedicated to fulfil the needs of young fashion industry. For the first time, Bonaveri has applied its knowledge and craftsmanship skills, into the medium segment of fashion market as...."Everybody deserves its quality mannequin". TRIBE is marketed under the new trademark "B by Bonaveri" that sits beside the other two company brands "Schläppi" and "Bonaveri Artistic Mannequins". Bonaveri presents the first biodegradable mannequin in BPlast and BPaint. BPlast is a natural, biodegradable bioplastic made up of a 72% sugar cane derivative. The production of mannequins in BPlast reduces CO2 emissions compared to petrochemical plastics commonly used. The BPlast mannequins are created with BPaint paint: a colour range made exclusively by Bonaveri from 100% natural plant-based resins and oils. We only use plant-based, phosphorous-free surfactants and solvents all from orange peel and desiccant-free cobalt salts and naphtha. BPlast and BPaint are just the first steps towards a unique way of thinking about our work, combining ethics and aesthetics: a testament that creating a different future is possible. Schläppi is a Swiss that Bonaveri bought in 2001, together with all relevant assets. The original Schläppi mannequins were conceived and made thanks to the intuition of two visionary men: Mr. Schläppi and sculptor Lorenzo Piemonti. The collaboration between these two men, starting in the mid-1950's, resulted in the creation of extraordinary and evocative forms for over twenty years. Bonaveri, since 2001, has brought the collections into the present, empowering Schläppi with a strong point of reference in the world of fashion and has been developeing further Schläppi collections that are based in Piemont's original design philosophy. There come ALOOF and NOBLE, the two latest Schläppi collections! For a overall view of all the collections, visit the link below. The female and male Schläppi 2200-3000 mannequins are the most iconic and classic of the Schläppi collection. They are characterised by their elegant and demure poses. This collection offers the most versatility with an extensive range of positions available. Noble, the new male Schläppi collection has been designed by Bonaveri in our sculpting atelier in Cento. Noble is intended to be the male companion to Aloof, the previously released female Schläppi Collection. We set out four guidelines for the development of Noble; A sense of presence, dedicated thought, elegance and an ability to group with other mannequins. The collection exhibits these four features remarkably well and gives the collection a strong sense of identity. The classic Bonaveri Collections are characterised by their extremely sought-after anatomic forms. They exhibit a sartorial elegance and showcase the highest expression of Italian handicraft. The Female and Male mannequins are divided into 04, 08 and Urban collections and Bonaveri create classic bust forms with or without heads and articulated arms. Established in 1950, Bonaveri is one of the world’s leading manufacturers of high quality mannequins. The ability to combine manufacturing excellence with visionary research on form and shape has allowed Bonaveri to participate in the birth, definition and growth of the fashion industry in Italy and around the world. Bonaveri produces around 18/20 thousand mannequins a year; the two lines "Bonaveri Artistic Mannequins" and "Schläppi" (the Swiss trademark acquired in 2001) cover the entire scope of this merchandise category (mannequins, bust forms, displays). Bonaveri has always had direct relations with biggest stylists excelling in the creation of personalized mannequins. The "Bespoke Area" is an important part of its business. Starting from 2017, a new brand "B by Bonaveri" stands beside the other two trademarks, including its first mannequin collection, aesthetically and technically performing, dedicated to fulfil the needs of young fashion industry: TRIBE. For the first time, Bonaveri has applied its knowledge and craftsmanship skills, into this market. "There cannot be quality without responsibility"; this is why in 2012, Bonaveri launched an ambitious research project, when it appointed the Politecnico di Milano to undertake a Life Cycle Assessment on their entire mannequin production, with the goal to reduce its environmental impact and of its clients. Through detailed analysis and research, Bonaveri is proud to have produced a material that is a truly biodegradable natural plastic from renewable sources (BPlast made for the 72% out of sugar cane derivatives) and a 100% plant based paint (BPaint). BPlast and BPaint have been certified by the Belgian certification institution, Vinçotte that issued the “OK BIOBASED” certificate. The world's first biodegradable mannequin was launched in September 2016, during London Fashion Week, at the Green Challenge Carpet 2016, a dynamic platform, pairing glamour and ethics to raise the profile of sustainability, ethics and social welfare, founded by Eco-Age and its Creative Director Livia Firth. Bonaveri is based in Renazzo di Cento (FE). The manufacturing facility combines craftsmanship with automation. 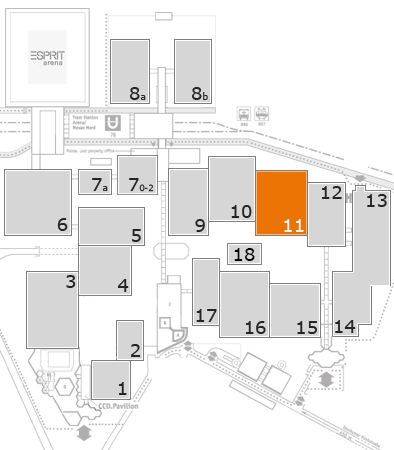 In a 40.000 sqm area, the company building is occupying 12.000 sqm (of which 2.000 sqm are dedicated to offices and showroom) and is surrounded by a 10.000 sqm green area. Within the headquarter are also present a canteen, a photo-studio, a relax room with pool table and other entertaining activities. The company has representatives in New York, London, Paris, Düsseldorf, Amsterdam, Antwerp, Zurich, Thessaloniki, Singapore, Seoul, Tokyo, Melbourne and in 2010 founded Bonaveri Hong Kong to deal directly to the Far East markets. In a vision of investment and widening of the sales network as well as representation of company’s values, among which the valorisation of Made in Italy, in December 2014 a new showroom was opened in Milan: BONAVERIMILANO is a unique space e dedicated to both promotional and commercial activities. In April 2016, Bonaveri opened another showroom in Shanghai, BONAVERISHANGHAI, to support the growing of this new emerging market. Today, Bonaveri means Mannequin and wherever is quality fashion – in a shop, in a museum, in a photo-shoot – Bonaveri mannequins are present.